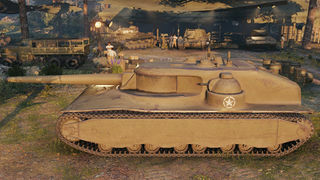 Der T28 Concept ist ein amerikanischer premium Jagdpanzer der Stufe 7. Die Entwicklung dieses schweren Durchbruchpanzers wurde September 1943 begonnen. Es sollten bestimmte Teile des Panzers M6 übernommen werden, wie der elektromechanischer Antriebsstrang und das 105-mm-Geschütz des T5, eingebaut in eine Turm mit eingeschränkter Traverse und 203-mm-Panzerung. Das Fahrzeug sollte die deutschen Befestigungen des Westwalls (in den USA als „Siegfriedlinie“ bekannt) angreifen. Die Bodentruppen der USA lehnten das Projekt in der Entwurfsphase ab. Das Fahrzeug wurde später zum schweren Durchbruchspanzer T95 umgebaut. 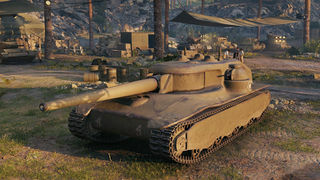 The T28 Concept is available as a reward for completing the second set of Personal Missions. Good all around armor, especially on the "turret"
While armor is great, this tank has multiple drawbacks. The armor is great only against opponents who are unfamiliar with the weakspots of the tank (miniturrets which are visible to all sides and angles). Hull armor can be penned from all sides by using premium ammunition by most tanks it meets. When armor can't be relied on, the health pool is quite low and T28 Concept ends up dead in a couple of shots. Popular Russian 122mm guns can 2-shot this TD on a moderately high damage rolls. And three shot is guaranteed. Low pen and accuracy by tier 7 standards, not to mention by tank destroyers standards, combined with high ammo cost and non premium credit profile (see accuracy comment) can make losses expensive, especially on non premium account. Also the rate of fire leaves much to be hoped for as low pen and bad accuracy make non damaging shots quite frequent. Low mobility combined with bad gun depression can make positioning for a shot frustrating. However, when top tier it makes for a great corner fighter. Using a wall you can angle to hide one of your miniturrets, and the wall will hide the other. The good gun traverse allows you to take a sharp angle, and bounce many standard rounds. It can be an effective city brawler in this way, although you still need support to prevent you from getting outflanked. Finally even the crew training part has a drawback as only the tier ten tank destroyers (T110E3 and T110E4) from the American tree have the same crew layout. 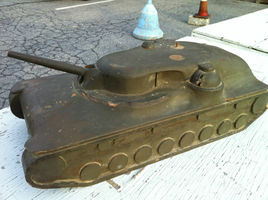 The T28 Concept is based on a wooden model, of which no historical records of its armor, armament or design specifications exists. Diese Seite wurde zuletzt am 25. Oktober 2016 um 14:14 Uhr geändert.